So what about that DUAL ANALOGUE FILTERING wording? Well, as implied, Impulse Command comes complete with two CEM chip-style filters — the same type as those used in classic synths such as the Elka Synthex, Fairlight CMI, Oberheim OB8, and Sequential Circuits Prophet-5, to name but a notable few. Despite sharing the same core circuitry as those vintage classics, Impulse Command is imbued with its own sonic character, rather than simply sounding like them. Many of the controls are duplicated for each of those 24dB/octave filters. The upper VCF is called VCF-L (left) and the signal — following its own dedicated VCA — is routed to the left output jack. It stands to reason, then, that the lower VCF is called VCF-R (right) and the signal — following its own dedicated VCA — is routed to the right output jack. Commonly, CUTOFF sets the master frequency cutoff for both filters, while PEAK sets the resonance/feedback level of both filters. Further left field, perhaps, VCF-R DETUNE offsets the second filter’s frequency cutoff, while VELOCITY sets the amount of MIDI velocity that will modulate the cutoff of both filters, and AGGRO adds cross modulation from VCO2 to the filter CUTOFF, creating a more edgy sound — increasing PEAK to higher levels emphasises this effect. Elsewhere, there are no fewer than four modulation sources — namely, EG1, EG2, LFO1, and LFO2, while LEVEL sets the level of modulation applied to the filter CUTOFF. Creatively, MOD INVERT inverts the modulation for VCF-L, which, as an example, enables pseudo-auto-pan effects. External sound sources, such as vocals, guitars, mixer sends, and samplers, etc, can be sent through the filters for further treatment by simply plugging the sound source into the rearside IN (input) socket. All in all, a flexible filtering section that belies this relatively diminutive desktop device’s space-saving (322 x 270mm) footprint. Processing plays a part in Impulse Command’s musical makeup. Primarily designed as a powerful analogue synthesizer, some essential effects — bit crush, delay, flanger, and reverb — have been included to give the resulting sound some ambience. The latter three effects can even be modulated to a degree by the STEP SEQ (sequencer), so they can be dynamically controlled! Control-wise, turning EFFECT selects the eight presets, while ASPECT1 and ASPECT2 are used to make some adjustments to the sound space preset selected. Sequencing is where the sounding-like-several-synthesizers-simultaneously-playing-Impulse Command can come into its own like no other, though. There are two sequencers — an analogue STEP SEQ (that produces voltages) and a MIDI LOOP SEQUENCER (that produces MIDI note loops). 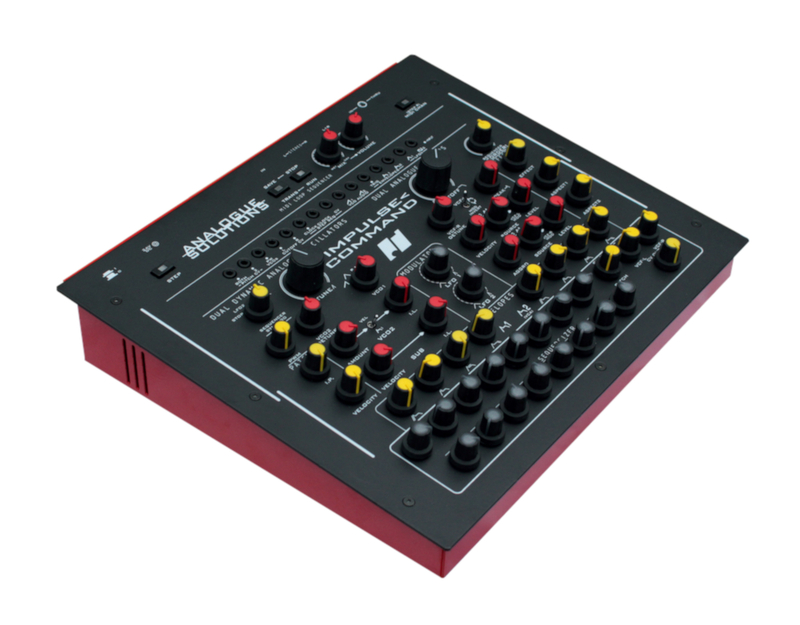 Both are clocked from the same signal source, selected using the SEQUENCER SYNCHRO switch, though the MIDI LOOP SEQUENCER can be independently stopped and started. As implied by name, the MIDI LOOP SEQUENCER is used to record melodic loops and will always run in time with the analogue STEP SEQ, which is primarily used for modulation. But both benefit from the radical REORDER! function that affects the sequencer stepping order — forwards, backwards, and all sorts of strange yet wonderful variations! It’s a lot like life, even.